Hi there! Thanks for coming by to check out our Bulldogs! 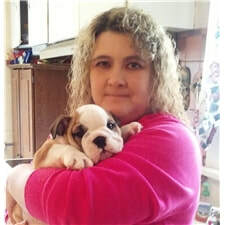 My name is Becky and my husband Chris and I raise Quality AKC French and English Bulldogs. The French and English Bulldog are a popular breed, very intelligent, loyal and friendly. If you want to buy a beautiful AKC registered French or English Bulldog puppy, then we are here to help. All of our puppies go to their new families with a one-year Health Guarantee, up to date on vaccinations, veterinary health checked, microchipped, and ready to snuggle & play. We offer shipping within the USA via TLC Flight Nannies. We can also deliver or meet halfway free of charge (up to 8 hrs round trip). We can accept debit/credit via PayPal or Cash.